What a mouthful! Bacon. Chocolate. Shortbread. Ice Cream. Sandwiches. I’m not going to lie to you guys: these ice cream cookie sandwiches are messy to eat. Messy to assemble. You might end up eating three buttery cookies in succession. You might break a few cookies when you become a little too aggressive in pressing down the top cookie into the ice cream. You might make a (delicious) mess of melted strawberry ice cream and mini chocolate chips and crumbled bacon. And you might have to ask a couple of friends to come quickly and get these out of your house before you polish off the entire batch. But these sure taste incredible. 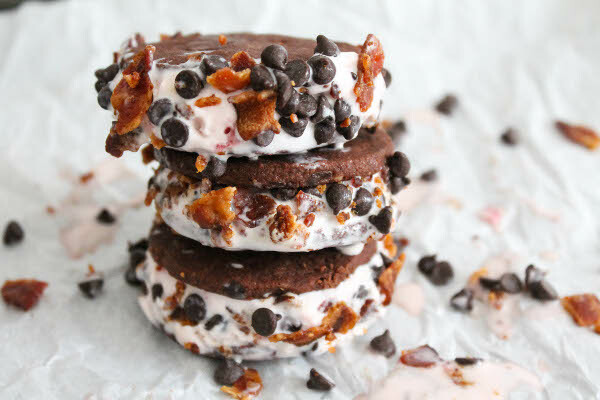 Just imagine: buttery chocolate shortbread cookies with mini chocolate chips and crumbles of salty bacon + sweet creamy strawberry ice cream + more chocolate and bacon. It’s so worth the mess. When Jones Dairy Farm asked me to develop a couple of recipes for the summer (the first one I made was this Chocolate Chip Banana Bread with Candied Bacon), I knew immediately that I would have to make some sort of ice cream sandwich rolled in bacon crumbles. After all, ice cream is synonymous with summer, and bacon is synonymous with yum. It also happens that today is National Ice Cream Sandwich Day. That’s right. There’s a holiday for everything. I modified my go-to shortbread recipe (which I last used to make Alfajores) to make a chocolate version, and folded in teeny chocolate chips and crispy crunchy bacon. Instead of my usual method of rolling out the dough with flour (thereby making another big mess with flour all over my counter top and my rolling pin), I placed the dough in between two pieces of parchment paper, rolled it flat, stuck in the freezer for 10 minutes, then used a cookie cutter to make little circles It was a much cleaner method. 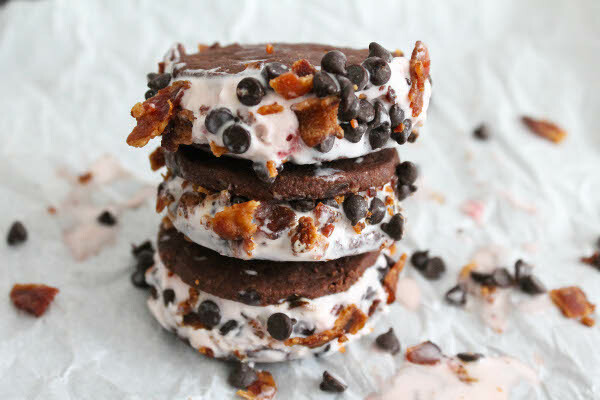 It was a challenge making these ice cream sandwiches in 90 degree weather because the ice cream kept melting and I kept snacking on the bacon and chocolate. Okay, that has nothing to do with the weather. 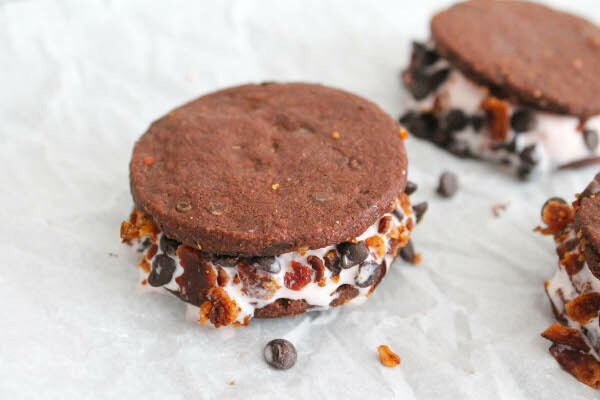 But seriously, these ice cream sandwiches are perfect for hot summer temps. Cold, sweet, salty, crunchy, creamy all in one bite. 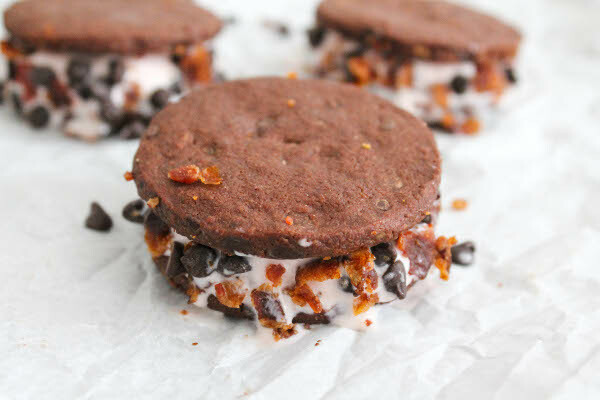 The bacon adds a nice salty component, and the dark chocolate shortbread cookies are a nice alternative to the typical chewy cookies used in ice cream sandwiches. And I did mention they’re mini, right? Which means you can eat more. Just make sure to have some napkins nearby! Cook the bacon. Place slices in a foil-covered cookie sheet or flat baking pan and bake without turning for 15 minutes. Drain on paper towels. Chop into small pieces or crumbles. Make the cookies. In a big mixing bowl, combine flour, butter, sugar, cocoa powder, and chocolate extract. Mix together until the dough can form into a ball. You can also use a food processor or a stand mixer. Fold in bacon and chocolate chips. Place dough in between two sheets of parchment paper and roll out until about a quarter inch thick. Chill in the freezer for 10 minutes, then cut into rounds using a cookie or biscuit cutter. You can take the scraps and re-roll. Bake cookies for about 14 minutes. Let cookies cool for about 15 minutes. 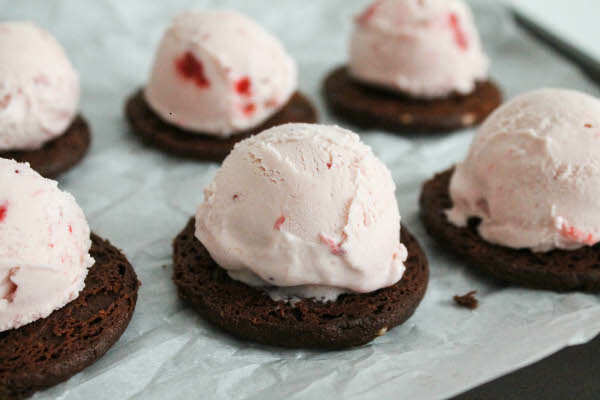 Assemble the ice cream sandwiches by placing one scoop of strawberry ice cream between two chocolate shortbread cookies and pressing together lightly. 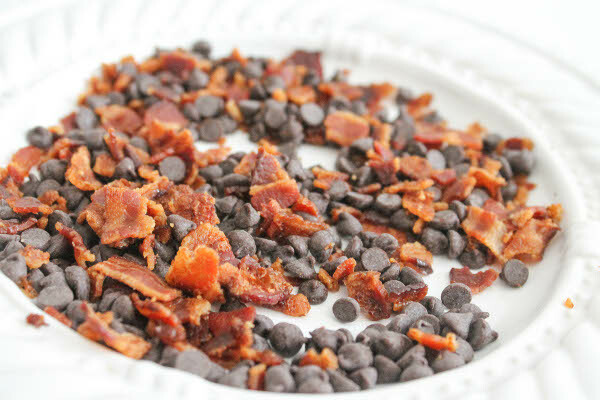 Combine mini chocolate chips and remaining bacon crumbles. Roll the sides of each ice cream sandwich in this mixture for garnish. You can also pop the cookies back in the freezer before rolling in the garnish. Eat immediately! If you are making the ice cream sandwiches in advance, wrap each sandwiches individually in plastic wrap before storing in the freezer. On a side note, I had to run a quick errand as soon as I finished cooking the bacon for this, and the guy next to me in line at the store leaned a little closer to me than normal as he took a big whiff of my bacon-scented hair. Bacon, making me more attractive since 2014. Disclosure: I received compensation and product samples to develop this recipe for Jones Dairy Farm.